From the Hancock County Courthouse, take Hwy 22 southwest for 7.2 miles to Devereux. Turn right (at the backward fork) onto Main Street. Go 0.2 mile to the dead end and turn left onto Jones Chapel Rd. Go west on Jones Chapel Rd for 1.3 miles to Davis Rd. Turn left on Davis Rd. Go approximately 0.5 mile. After crossing over the wooden bridge over the railroad track, you will come to a fork in the road. Take the right road, Reynolds Chapel Road, for 0.1 mile to the entrance of the cemetery on the left. Alternately, from the intersection of SR 22 and Pine Valley Road, go 1.5 miles on Pine Valley Rd. to the fork. Bear left. Cemetery is about 100 feet ahead on the left. Graves appearing in Lot 99 have been added since the original survey and are based on obituaries. 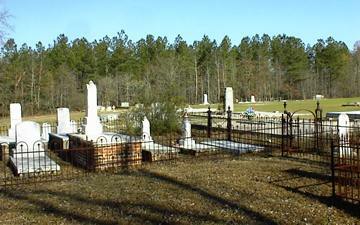 The graves are believed to be somewhere within the cemetery. Daddy. Photograph of Henry Smith is on marker. Mother. Photograph of Omie Smith is on marker. d/o Henry E. & Mary Jane Simmons. Infant s/o Willie and Grace Collins. Infant s/o Vol and C. Collins. S/o W. M. and E. R. Amoss. Married James E. Bass Feb. 12, 1896. "Maggie". S/o Margaret M. and James E. Bass. Married Neill McMillan Jul. 3, 1854. No birth date listed. Pvt. Co. C, 3 Ga Mil. Pile of bricks - may not be a grave. Charity and Honesty was his religion. S/o J. B. and Minnie B. Kennedy. w/o J. B. Kennedy Sr.
s/o J. A. and T. E. Palmer. "Our little angels." In same grave with John Preston Waddell. "Our little angels." In same grave with Baylee Daniell Waddell. w/o J. G. McCue. No birth date listed. s/o J. W. & C. G. Moate. w/o Rev. John P. Moate. Last name is spelled "Stancell" on military marker. Co. C, 1 Georgia Sharp Shooters. s/o Richard & Mary Pound. Children of G. G. & Lora Stacer. He carries the lambs in His bosom. In same grave as "Infant" Stacer. Children of G. G. & Lora Stacer. He carries the lambs in His bosom. In same grave as Ouida Blanch Stacer. Killed in the Battle of Argonne Forrest France. "And the glory, the glory of the Lord shall be revealed." (Musical score on marker.) "Pappy Red". Trumpet engraved on marker. w/o Roy D. Wilson Sr.
s/o Dr. and Mrs. J. M. Courson. Empty lot has "Whorton" on coping. He giveth his beloved sleep. On same headstone with David L. Butts. He giveth His beloved sleep. On same headstone with Eldna Young Butts. No death date as of March 2002. PFC 794 ORD. LT. MAINTENANCE CO.
On same headstone with Hattie B. Arnold. Mattie L. Arnold Simmons, Sr. Empty lot near Lot 16 has "Boyer" on coping. New graves since original survey. Located somewhere in cemetery. Graves in this lot are new graves, and their locations in the cemetery have not been identified. Age 74. Date on military marker has birth month as April, not May.